Srirangapatnam is an island set into the River Kaveri in the modern-day state of Karnataka in south-west India. The Vijayanagar rulers built a fort here in 1454. In 1616 it became the capital of the Mysore Wadayar Rajas. 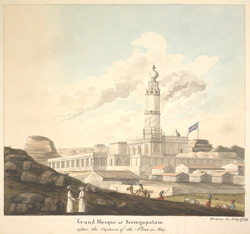 Later it was the capital of the renowned Rajas of Mysore, Haidar Ali (c. 1722-1782) and Tipu Sultan (1753-1799). Haidar Ali and Tipu Sultan were responsible for turning the small state of Mysore into a major Muslim power but were opposed by the Marathas, the Nizam of Hyderabad and the British who engaged with the Rajas in four wars for the control of southern India. On 4 May 1799 the British stormed the Raja’s island fortress at Seringapatam and Tipu Sultan was killed. This painting was executed shortly after that event.